Last weekend, we went to Tanjung Balau beach to enjoy a starry night and more important, to watch the Perseids meteor shooting stars! The night sky was clear and full of stars before 9pm. It was beautiful. But from then on, the sky was covered by clouds, well, til the next morning. I guess we will wait for the next meteor rain in November. Star/Meteor Shower Gazing - the beach has little light pollution at night. All you need is a bit of luck. Swimming - Bring your swim suit to public beach. There is a swimming pool at Pelangi Balau resort if you stay there. BBQ - Bring your own food and BBQ gears to public beach, or the beach at jetty. Or you can pay for BBQ package/site provided by resorts. Play Kites - Bring your kites to the large grass field at public beach. Photographing - Go to public beach during sunset, wake up for sunrise. Check out the rocks at the jetty beach. Fishermen Museum - there is a fishermen museum at public beach. Free admission. There are 2 budget resorts at the jetty, 10-minute walk from public beach. Pelangi Balau Resort has a swimming pool and cafe. We stayed here because of its cheap Ramadan promotion rate, but the room is dusty, they should have done the housekeeping. Bayu Balau Beach Resort is a new budget resort next to Pelangi Balau Resort, recently took over the previous chalet facility. Reservation: +607 8221212, +607 8321220, +6013 7231330. You can find more mid-range resorts in Desaru, home stays in Penawar town or further at Teluk Sengat. Head southeast on Senai-Desaru Highway towards Desaru. Exit at Penawar toll (check toll fares). Go straight, follow the signboard to “Tanjung Balau” or “Pelangi Balau Resort”. Turn left after pass by Pelangi Balau Resort. Arriving at Tanjung Balau Beach. You can reach here by boat from Changi Ferry Terminal or by bus at Johor Larkin Bus Station. Ramadan Promotion - Ramadan (Muslim’s fasting month) is a good season to visit. Look for resorts that offer promotion rates. This year (August 2012), Pelangi Balau Resort offer MYR 80 (50% off) for Standard Room (without breakfast). Eat during Ramadan - It can be tricky to find food in Penawar town during fasting month. Bring your own food (what we did :), or eat seafood at Pengerang (30-minute driving distance from Desaru). BBQ at Public Beach - to avoid extra charges from your resort. The jetty beach is a good spot for campfire and BBQ, and safer since it’s nearer to the resort. Bring Torch Light - the beach is really dark after sunset. 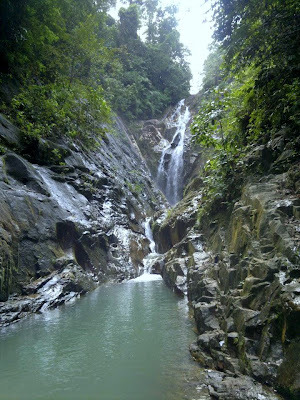 Last weekend, we revisited Gunung Pulai (or Mount Pulai) with two of my friends. This month (July 2012) happens to be a good season to visit local waterfalls. Rains are driving up the water level, while we still can enjoy the big sunny days. Mountain Walk/Biking - Most people enjoy walking up the hill in the morning. It has a well-built tar road, with 1.5 to 2 hours of walking time to reach the summit. Mountain bikers love the steep slopes here. Picnic and Swimming - That’s what we went for! :) The main waterfall is 20-minute walk from entrance gate. It has a small pool with cold fresh running water, starting from shallow to over 2-meter deep. Photographing - In a sunny morning, you will see sun rays shine through tree leaves on the way to the waterfall. Don’t miss that! Save the Earth - There are a lot more polystyrene plates and cups scattered all over the waterfall site, since my last visit. Before we left, my friend Kok Haur decided to help cleaning up the mess, but we definitely need more hands! From Johor Bahru, take PLUS North-Sourth expressway towards Kuala Lumpur. Exit at Kulaijaya toll, you will see the red signboard “Gunung Pulai”. Turn right onto Jalan Sawah. Drive straight until you see the signboard “Kampung Sri Gunung Pulai”. Turn left into the village. Go straight and arrive at the entrance carpark. Come early - Morning is the best time for picnic and mountain walk. Part of the waterfall site and mountain track are directly exposed under the afternoon sunlight. Parking - You will see a carpark space at the entrance with RM1 fee. Washroom - There is one small washroom at the parking site for you to change clothes and shower. Leeches - If you follow wet dirt track towards the waterfall, watch out for leeches. Bring some garlic, leeches hate garlic smell. Eat - No food stalls in the village. Usually I have my breakfast in Kulai town, and for lunch as well. As I know, there are 2 more waterfall sites hidden further in the mountain. I will blog about them when I go there again. Stay tune! Walk Walk Blog is up! I will start sharing my weekend runaway trips here, as well as any upcoming interesting local events in the town. Gee, I need a new Octopress theme.